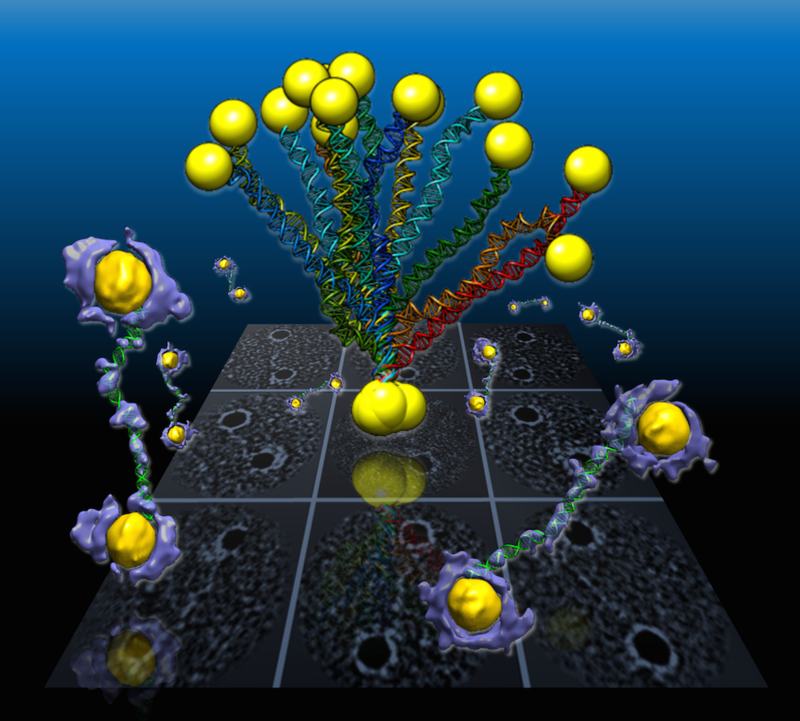 An international research team working at the Lawrence Berkeley National Laboratory (Berkeley Lab) has captured the first high-resolution 3D images of double-helix DNA segments attached at either end to gold nanoparticles — which could act as building blocks for molecular computer memory and electronic devices (see World’s smallest electronic diode made from single DNA molecule), nanoscale drug-delivery systems, and as markers for biological research and for imaging disease-relevant proteins. The researchers connected coiled DNA strands between polygon-shaped gold nanoparticles and then reconstructed 3D images, using a cutting-edge electron microscope technique coupled with a protein-staining process and sophisticated software that provided structural details at the scale of about 2 nanometers. “We had no idea about what the double-strand DNA would look like between the gold nanoparticles,” said Gang “Gary” Ren, a Berkeley Lab scientist who led the research. “This is the first time for directly visualizing an individual double-strand DNA segment in 3D,” he said. The results were published in an open-access paper in the March 30 edition of Nature Communications. The method developed by this team, called individual-particle electron tomography (IPET), had earlier captured the 3-D structure of a single protein that plays a key role in human cholesterol metabolism. By grabbing 2D images of an object from different angles, the technique allows researchers to assemble a 3D image of that object. The team has also used the technique to uncover the fluctuation of another well-known flexible protein, human immunoglobulin 1, which plays a role in the human immune system. For this new study of DNA nanostructures, Ren used an electron-beam study technique called cryo-electron microscopy (cryo-EM) to examine frozen DNA-nanogold samples, and used IPET to reconstruct 3-D images from samples stained with heavy metal salts. The team also used molecular simulation tools to test the natural shape variations (“conformations”) in the samples, and compared these simulated shapes with observations. A popular way to view the nanoscale structural details of delicate biological samples is to form them into crystals and zap them with X-rays, but that destroys their natural shape, especially fir the DNA-nanogold samples in this study, which the scientists say are incredibly challenging to crystallize. Other common research techniques may require a collection of thousands of near-identical objects, viewed with an electron microscope, to compile a single, averaged 3-D structure. But an averaged 3D image may not adequately show the natural shape fluctuations of a given object. Berkeley Lab | These views compare the various shape fluctuations obtained from different samples of the same type of double-helix DNA segment (DNA renderings in green, 3D reconstructions in purple) connected to gold nanoparticles (yellow). The samples were flash-frozen to preserve their structure for study with cryo-EM imaging. The distance between the two gold nanoparticles in individual samples varied from 20 to 30 nanometers, based on different shapes observed in the DNA segments. Researchers used a cryo-electron microscope at Berkeley Lab’s Molecular Foundry for this study. They collected a series of tilted images of the stained objects, and reconstructed 14 electron-density maps that detailed the structure of individual samples using the IPET technique. Ren said that the next step will be to work to improve the resolution to the sub-nanometer scale. The team included researchers at UC Berkeley, the Kavli Energy NanoSciences Institute at Berkeley Lab and UC Berkeley, and Xi’an Jiaotong University in China. This work was supported by the National Science Foundation, DOE Office of Basic Energy Sciences, National Institutes of Health, the National Natural Science Foundation of China, Xi’an Jiaotong University in China, and the Ministry of Science and Technology in China. View more about Gary Ren’s research group here. DNA base pairing has been used for many years to direct the arrangement of inorganic nanocrystals into small groupings and arrays with tailored optical and electrical properties. The control of DNA-mediated assembly depends crucially on a better understanding of three-dimensional structure of DNA-nanocrystal-hybridized building blocks. Existing techniques do not allow for structural determination of these flexible and heterogeneous samples. Here we report cryo-electron microscopy and negative-staining electron tomography approaches to image, and three-dimensionally reconstruct a single DNA-nanogold conjugate, an 84-bp double-stranded DNA with two 5-nm nanogold particles for potential substrates in plasmon-coupling experiments. By individual-particle electron tomography reconstruction, we obtain 14 density maps at ~2-nm resolution. Using these maps as constraints, we derive 14 conformations of dsDNA by molecular dynamics simulations. The conformational variation is consistent with that from liquid solution, suggesting that individual-particle electron tomography could be an expected approach to study DNA-assembling and flexible protein structure and dynamics.